To celebrate the twentieth anniversary of their AIDA64 software, FinalWire has released versions of the app for iOS and Windows Phone. AIDA64 has existed on Android for some time now, and the expansion to iOS and Windows Phone means that it's available on all of the major mobile platforms. At the moment, the app can display various information about a device's hardware and software. Most of it appears to be taken from the device itself, which means that there is some variance between what shows up on an iOS device and what shows up on Windows Phone. 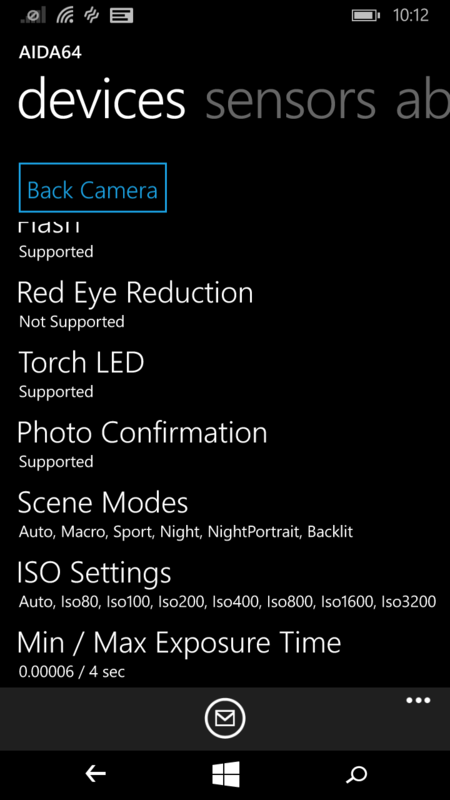 For example, the iOS version doesn't expose the different ISO and shutter speed settings used by the camera app. Some other information appears to have been manually added based on what is known about a device but not exposed by the operating system. This seems to be more of the case on the iOS side, where Apple's A8 will report its microarchitecture as "Cyclone 2". In the case of A7, the process technology reports as 20nm, which appears to be a mistake, as A7 is actually fabbed on Samsung's 28nm process. I appreciate the fact that FinalWire has taken the time to design each app for its respective operating system instead of using the same interface across all of them. AIDA64 for iOS and Android is available now in each platform's respective store for apps. On iOS the app is free with ads, and a $1.99 option to remove ads can be purchased if desired. There don't appear to be any ads in the Windows Phone version yet. I guess I'm just not sure what the point is here. AIDA is a tool to quickly assess the hardware in a PC, and it's useful because of the millions of potential PC configurations using thousands upon thousands of different components.